Protesters met inside the Villeray—Saint-Michel—Parc-Extension borough hall to give their two-cents about the transformation of a former community hub into luxury apartments, in a question period with mayor Giuliana Fumagalli and other city officials, Tuesday night. Dissatisfied with the outcome of the questions being asked, the crowd “got a little bit heated,” Guay said. Council members asked that those not at the microphone asking questions to stop, or else the discussion would be suspended. On Jan. 11, real-estate development firm BSR Group’s hopes to redevelop Hutchison Plaza were dented after the Comité consultatif d’urbanisme didn’t grant them the permits they needed. Despite that, locals said they plan to continue organizing against further gentrification in the neighborhood. Before attending the meeting, protesters met in front of Parc Metro station to voice their concerns over the ongoing issue regarding the plaza, which has long been seen as “a home and a community center,” for over 20 years, according to Adeel Hayat, who has lived in Parc-Extension for 13 years. “Somebody bought this building and they decided to kick everybody out without asking the community,” he continued. Since March, the new owner of the building Ron Basal has steadily been evicting tenants from Hutchison Plaza to make way for luxury apartments. Amy Darwish, who is part of the support group, added that the construction taking place was done illegally with missing permits. After receiving fines for that, Basal threatened to cut off water and electricity on Jan. 8. “We are here today to send a clear message to the borough council that this project and others like it must not go through,” said Darwish. 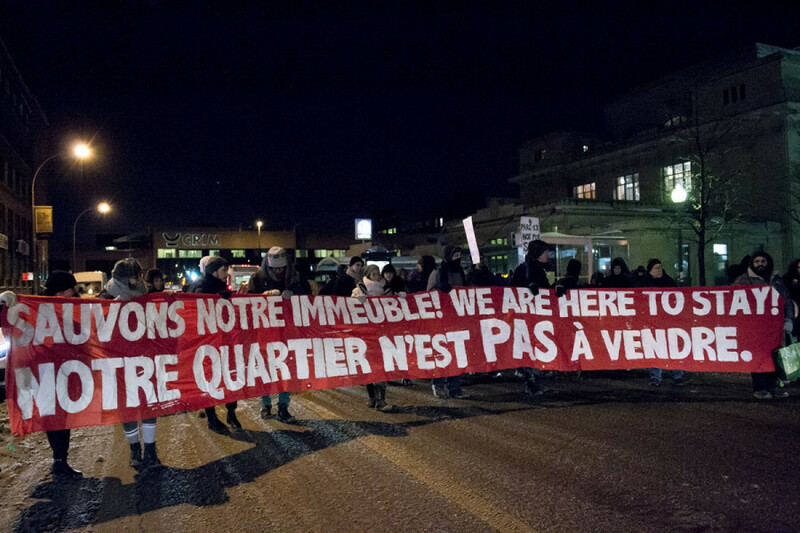 Protesters marched down Jean-Talon St. Ouest. One held up a sign saying “Parc-Ex Not For Sale.” Later, they reached Villeray—Saint-Michel—Parc-Extension borough hall, where a council meeting was in session. Darwish said that they hope to prevent the BSR group and other developers from profiting off the displacement of tenants, not only in Parc-Extension but across Montreal, saying they will be met with significant resistance. “We do believe this is well within the borough’s jurisdiction to stop this project,” Darwish said. The next urban consultation meeting is set to take place on Feb. 12, at which Darwish suspects the landlord will again try obtaining permits.